Brothers and Sisters in Armbands. For parents who lost a child the dynamic is completely reversed. Fleeting moments of fear are replaced with innumerable moments wishing that our child was playing that game, singing in that choir, opening a Christmas gift or blowing out those birthday candles. Everyday moments become unwelcome reminders of our loss. Our fleeting moments are the happy ones; washed away from the shores of our minds by the sad tides of reality. Child-loss is incredibly isolating. As recently as just a century ago, it was highly likely (expected even) that a family would lose a child. It was rare for a family to never experience the pain of burying a child. A hundred years ago the families that didn’t lose a child were the “lucky” ones. Those who lost a child were the norm and had a large support group to share their pain with. That is not the case today. Nowhere is that statement more true than in the avoidance I engaged in for the past four years. We lost our little boy, Richard Edwin-Ehmer (Rees) Specht, on October 27th, 2012 to a drowning. It would seem natural for us to start a foundation about water safety, but the reality is that neither my wife Samantha nor I were interested in doing that at all. We both felt that doing so would simply make us hypocrites telling others to do that which we failed at. In fact, we originally had no plans to start a foundation at all. We simply wanted to thank the people who bestowed amazing acts of kindness upon our family in the wake of our most desperate hour. It turns out that not a single person would let us pay them back. Family, friends and even complete strangers, such as the Kelly Brothers Landscaping company that cleaned and re-designed our landscape free of charge after we lost Rees, would not allow us to pay them back. When no one allowed us to pay them back, we simply decided to “pay it forward”. We had 5000 “ReesSpecht Life” pay it forward cards printed up with the hopes of doing 500 random acts of kindness (if you are wondering if I made a mistake with the zeroes, I did not. I ordered 5,000 cards because, well, I’m a guy and 5,000 is better than 500, right?). 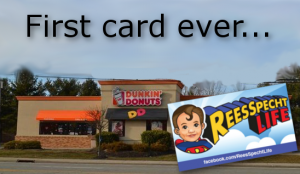 The first act of kindness we ever did was at the Dunkin’ Donuts drive-thru pictured. I simply paid for the car behind me and left the card. When I did it, I recall thinking that it was “1 down, 499 more to go”. It turns out my estimation was way off. A chain reaction of kindness began with our original act that resulted in cars paying for each the entire morning. Shortly afterwards we started getting requests for our cards, and the rest is history. 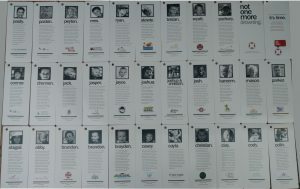 As of this moment we have now distributed over 430,000 cards to every continent on Earth. As requests for our cards started to grow, my wife and I realized we needed to make our movement “official”. We applied for non-profit status and were denied. It turns out that “kindness” isn’t something the government finds tangible. We were instructed that we needed a “real” reason to be granted non-profit status. For my family and friends the answer seemed obvious: Drowning prevention. Samantha and I did not agree. We still couldn’t do it. That all changed this past week. 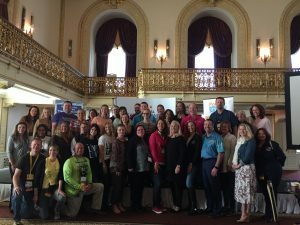 After much prodding, and a minimal amount of cajoling, Bobby convinced me to join him at the National Drowning Prevention Alliance conference in Pittsburgh Pa. As soon as we arrived I was overwhelmed. Pardon the pun, but I felt like a fish out of water. Bobby rapidly introduced me to so many people that my head began to spin. All I wanted to do was escape to my room and hide out. The ever growing pit in my stomach indicated I made a colossal mistake. That feeling continued into the evening. I tried my best to remain as inconspicuous as possible; attempting to just “blend in” and make it through the evening. 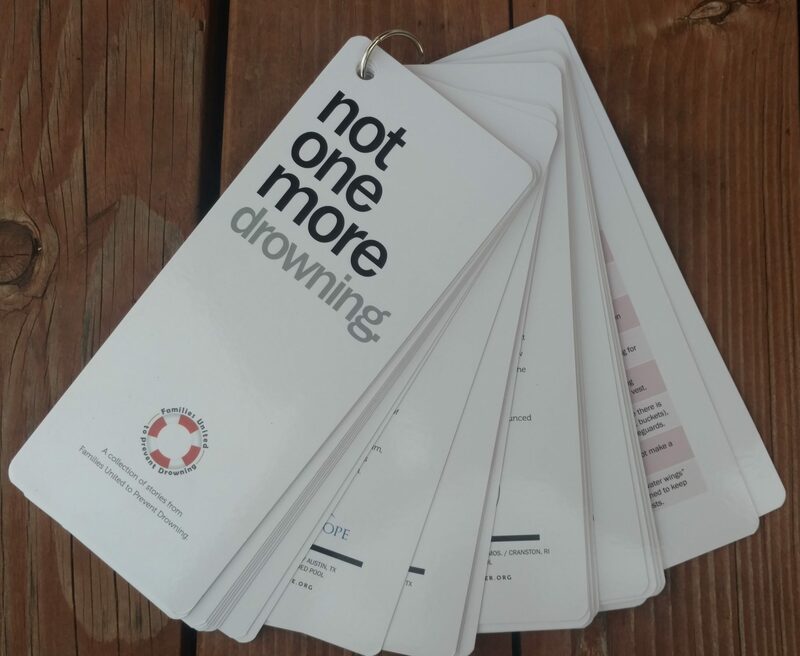 I had been invited to meet with the Family’s United to Prevent Drowning to help put together their “Not One More” book that contained the stories of 32 children (including Rees) from 31 families that had a child drown. I almost didn’t make it there, but something (someone?) nudged me to go. I was one of the last ones to make it to the room. I walked in trying again to hide in plain sight only to find my plan foiled when Bobby announced me to the whole group. I don’t know what I was expecting, but whatever it was it filled me with dread. I felt like I didn’t belong. No, I felt like I didn’t deserve to be there. My nerves continued to build and I felt that overwhelming urge to run away and then it happened. In an instant my fears were completely washed away. A sense of calm flowed over me as I was welcomed by everyone to the party that no parent ever wants to attend. As I looked around, the understanding eyes and acknowledging looks on everyone’s faces made me feel instantly at peace. Almost immediately a beautiful soul named TC came up to me to introduce herself and her husband Matthew. She told me she was excited (well not quite “excited”) that I was there because both her and her husband shared Rees’ love for tractors. She talked about her angel Casey and I talked about Rees. As our conversation wound down a realization struck me: Our mutual pain made our exchange completely natural. I didn’t need to “frame” how I talked about Rees and his accident because she and Matthew completely understood. It was eye opening and liberating. Free to be who I am. My eyes weren’t the only things opened after that. I soon found myself talking to other parents, shaking their hands, their eyes meeting my eyes with a reaffirming glint that confirmed they “knew” too. I recall stopping for a moment and looking around the entire room. As I gazed at my fellow members of our unfortunate fraternity something struck me… Almost everyone had a silicon armband on their wrists emblazoned with the name of their child and/or their movement’s name. They came in different styles, shapes and colors; every single one of them as unique as their lost child. I’ll be honest, up until that moment, I never really gave much thought to those ubiquitous silicone armbands before. Almost everyone I know wears one for one cause or another. That moment made me realize that each one of those bands means everything to someone. Every band in that room represented each parent’s undying love for a child they will never hold again. I immediately grasped my own armband, purposely placed on my left arm so as to keep it as close to my heart as possible, and began to weep with a realization that took four years to materialize: I wasn’t alone anymore. I took one of the “Not one more drowning” books back to my room that night. I read each story while simultaneously trying to fight back the torrent of tears streaming down my face. Each story was different, but the pain was the same. Every story I read brought back the agony of losing my little boy all over again. 31 stories. 32 children. Different circumstances, but the same pain. My heart was aching yet I, confusingly, felt at ease. The confusion ended the very next day. After several interesting seminars on different aspects of water safety we all gathered to hear a special address from the acting chairperson of the Consumer Product Safety Commission, Ann Marie Buerkle. After the address, chairperson Buerkle asked to meet with all the families from Families United to Prevent Drowning. She sat and listened for over two and half hours as we all took turns sharing the most awful moment of our lives. Even though I knew all the stories from having read them the night before, hearing them told by the parents of these angels was beyond emotional. Chairperson Buerkle in the room with the Families United. Just like the night before, I felt my heart aching, yet I was totally at ease. Looking around the room I realized why… The armbands. I began to see those armbands for what they really are: Links in a chain that bound us all together. The reason I was at ease was because I knew everyone of those links were as strong as mine was. Every one of those links represented parents that felt the way I did. Those links bound us together in a place we didn’t want to be, but wouldn’t be anywhere else considering the circumstances. And, most importantly, every single one of those bands represented someone who would be there to lift the other up if we felt like we were weakening. The reason I felt at ease is because I knew I was safe. There was no walking on eggshells. Everyone understood and we all knew each other’s pain. I imagined that this was probably a microcosm of what life was like for everyone centuries ago. 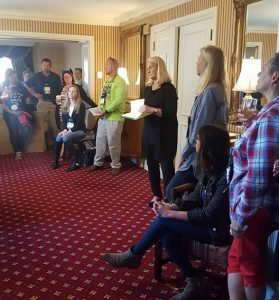 Our shared grief meant every person in that room wanted to make sure that no new families come to join us in the future. We had all been given the sourest of lemons and were trying to make the best damn lemonade we could. Whatever reservations I had about promoting water safety and drowning prevention are gone now. I left the convention buttressed by the strength of my fellow brothers and sisters in armbands. While the ReesSpecht Life Foundation will always be about kindness, I realized the greatest kindness is preventing another family from becoming a link in our chain. I hope you join us in our renewed commitment to End Drowning Now. RICH SPECHT is an author, public speaker and advocate for kindness. 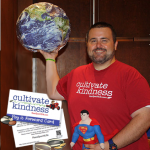 Rich authored the award winning children’s book A Little Rees Specht Cultivates Kindness. 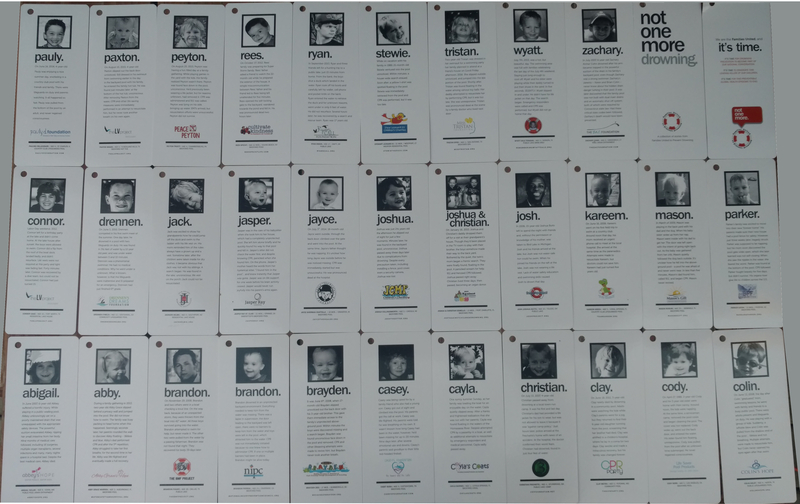 He and his wife, Samantha, are the co-founders of the ReesSpecht Life Foundation which they formed in the wake of the loss of their only son, Richard Edwin-Ehmer (Rees) Specht at 22 months old. The acts of kindness that the family received after Rees’ passing inspired them to “pay forward” that kindness; which the foundation does in the form of scholarships for High School seniors who demonstrate a commitment to their community, compassion and respect, as well as the distribution of more than four hundred thousand ReesSpecht Life “pay it forward” cards. An animated television series featuring the themes and characters from Rich’s books is in the works. The book and television adaptations of A Little Rees Specht Cultivates Kindness represents the culmination of Rich’s goal to help make this world a little better, one Rees’ piece at a time. Rich currently resides in Sound Beach, New York with his wife, Samantha, daughters, Abigail, Lorilei and Melina as well as his angel above, Rees.